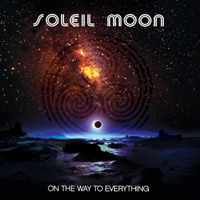 Soleil Moon is a duo formed by current Michael Thompson Band vocalist Larry King and keyboard player John Blasucci, they debuted back in 1999 with the independently released album "Worlds Apart". Both musicians have a long and varied background and have taken part in many projects, which clearly shows on this album. This is a Melodic Rock/Westcoast gem not to miss out on! The very melodic rock songs ooze of joy and happiness, and bring a lot of bright light in the otherwise dark days in the Northern hemisphere. From the classic AOR structures of songs like "History Repeats It's Pages", "On the Way to Everything", "Move On" or "Here I Am", to the brilliant piano ballad "Goodnight Irene", to the amazing acoustic cover-version of "Blackbird" (The Beatles), to country and western inspired "Colorado", to... I could go on and on, because this album is a real killer. And the three bonus tracks are all up to par with the rest of the material, and you might have heard "I'd Die for You" on the second Place Vendome album.